We’d love your help. Let us know what’s wrong with this preview of The Silver Pigs by Lindsey Davis. When Marcus Didius Falco, a Roman "informer" who has a nose for trouble that's sharper than most, encounters Sosia Camillina in the Forum, he senses immediately all is not right with the pretty girl. She confesses to him that she is fleeing for her life, and Falco makes the rash decision to rescue her—a decision he will come to regret. For Sosia bears a heavy burden: as he When Marcus Didius Falco, a Roman "informer" who has a nose for trouble that's sharper than most, encounters Sosia Camillina in the Forum, he senses immediately all is not right with the pretty girl. She confesses to him that she is fleeing for her life, and Falco makes the rash decision to rescue her—a decision he will come to regret. For Sosia bears a heavy burden: as heavy as a pile of stolen Imperial ingots, in fact. Matters just get more complicated when Falco meets Helena Justina, a Senator's daughter who is connected to the very same traitors he has sworn to expose. Soon Falco finds himself swept from the perilous back alleys of Ancient Rome to the silver mines of distant Britain—and up against a cabal of traitors with blood on their hands and no compunction whatsoever to do away with a snooping plebe like Falco…. To ask other readers questions about The Silver Pigs, please sign up. I'm not sure if I'll like this series, but I want to check it out. Fans of these books, should I try this one, or is there a different book that better showcases what's good about these? Don't worry, if I like it, I'll start at the beginning and read them all, but I'm open to starting elsewhere if it'll pique my interest more. I've found that the first book in some series can be a turn-off for newcomers. Thanks! Is this a pretty typical book for the series (it's #1) or do they get better? I ask since, so far, I haven't liked this one. J Y Rickeard They do get better, but if you haven't liked this one you might not like the others. Same cynical attitude, wry smiles, forbidden loves, but the…moreThey do get better, but if you haven't liked this one you might not like the others. Same cynical attitude, wry smiles, forbidden loves, but the writing becomes more assured, and the characters more likeable as you progress. The Silver Pigs is fun to read. And if you're looking to read to relax, there's no better praise. As I mentioned in my comment, the voice and tone reminded me of Glen Cook's Garrett, P.I. series sans the fantasy element. Even more strongly, I'm reminded of a Roman Rockford Files, which may be brilliantly illuminative to those of a certain age or who have a taste for '70s detective shows. For the rest, you can wiki it and then hunt down copies of the episodes (which stream on Netflix). But I'm digr The Silver Pigs is fun to read. And if you're looking to read to relax, there's no better praise. Marcus Didius Falco is an ex-legionary, current informer (i.e., private investigator) in the Rome of Vespasian (AD 69-79). If you're looking for fast-paced, engaging and smartly written bedside/airplane reading then I can recommend this series. Way back in early 2015, I read Lindsey Davis' The Ides of April. I liked it, and since it featured the daughter of Marcus Didius Falco, I thought I would eventually get around to the original character. The Silver Pigs is the first of many Falco novels that Davis wrote over a period of more than 20 years. I rarely think that an entertaining mystery merits five stars, but this one does. For many of us who would rather read historical mysteries than current true crime, the attraction is what an au Way back in early 2015, I read Lindsey Davis' The Ides of April. I liked it, and since it featured the daughter of Marcus Didius Falco, I thought I would eventually get around to the original character. The Silver Pigs is the first of many Falco novels that Davis wrote over a period of more than 20 years. I rarely think that an entertaining mystery merits five stars, but this one does. For many of us who would rather read historical mysteries than current true crime, the attraction is what an author can do to transport us to a different time and place and to make us understand (and/or feel) what it was like to breath and walk around in that remote land. Davis is a master at doing so with Imperial Rome. "We climbed up, then strolled side by side. In early April, just before dinner, we were virtually alone. It was all there. Nothing like it in the world. Six-story apartment blocks thrust upwards from narrow streets, confronting palaces and private homes with brotherly disregard for social niceties. Mushroom-beige light flaked the roofs of the temples or shimmered in fountain sprays. Even in April the air felt warm after the British wetness and cold. As we walked along peacefully, Helena and I counted off the Seven Hills together. While we came west along the Esquiline ridge, we had an evening wind in our faces. It bore tantalizing traces of rich meat dumplings gurgling in dark gravies in five hundred dubious cookshops, oysters simmering with coriander in white wine sauce, pork braising with fennel, peppercorns and pine nuts in the busy kitchen of some private mansion immediately below. Up to our high spot rose a distant murmur of the permanent hubbub below: touts and orators, crashing loads, donkeys and doorbells, the crunch of a marching Guards detachment, the swarming cries of humanity more densely packed than anywhere in the Empire or the know world beyond." It isn't just this Davis offers. There is mystery, murder, social commentary, history (both in Rome and in England), comedy of manners and family squabbles, politics and insights into ruling Flavian dynasty during its early stages. But more than all this, Davis weaves a story that takes the "informer" (that era's term for a private investigator) Falco from a callow opportunist to a more mature man. And, how that is accomplished you will have to read for yourself. Before I leave you, here is another selection. Enjoy! "It was a lively day, warm and bright, with a lift in the air....All the temples had been thrown open, and the baths were closed; incense, smoking on a thousand altars, grappled with the whiff of half a million people perspiring in their holiday clothes without a chance to bathe all day. Apart from one or two dedicated housebreakers slipping through deserted streets with discreet sacks of swag, everyone who was not in the procession was watching it. There were so many gawpers packed along the processional route that the marchers and floats could hardly crawl along. "My brother-in-law Mico (the plasterer) had for once been put to use. They sent him out at first light to erect a scaffold just for us in front of some unwary citizen's private house. There was not really room for a scaffold, but when the aedile's troops saw the entire Didius family installed on a day's hampers, all eating squelchy melons and wearing country hats, with their noses already stuck well down their gourds of wine and their throats full of ready abuse, the troopers accepted a slice of melon each then shambled off without trying to tear the scaffold down." She was sixteen. O Jupiter! She looked like a person who soon should be! 'Silver Pigs' begins at a run and it really doesn't let up. Marcus Didius Falco, a 70 AD Roman private informer whose usual jobs involve following young philandering wives for rich old husbands, finds himself in the middle of a mystery of murder and mayhem involving important senators of high rank and even the Emperor Vespasian himself. Thirty-year-old Falco has a large family and a mother, but they all are grieving for Falco's brother, Didius Festus, who was a heroic soldier in the Roman army an 'Silver Pigs' begins at a run and it really doesn't let up. Marcus Didius Falco, a 70 AD Roman private informer whose usual jobs involve following young philandering wives for rich old husbands, finds himself in the middle of a mystery of murder and mayhem involving important senators of high rank and even the Emperor Vespasian himself. Thirty-year-old Falco has a large family and a mother, but they all are grieving for Falco's brother, Didius Festus, who was a heroic soldier in the Roman army and who was recently killed while serving in Palestine. So, when a lovely young girl, Sosia Camillina, niece of Senator Decimus Camillus Verus and daughter of the senator's younger brother, Publius Camillus Meto, almost knocks Falco down on the steps of the Forum, he welcomes the distraction. Two big men were chasing the sixteen-year-old, so Falco gallantly helps her escape out a back door. The two new friends get to know each other in Falco's sixth-floor walkup flat over Lenia's laundry, which is also Falco's office. Sosia tells him she was kidnapped out of her uncle's house for reasons unknown, but she had managed to wriggle free from their grasp. After talking things over with Falco's best friend and fellow ex-soldier, Petronius Longus, now a Patrol Captain of the Aventine Watch (police), Sosia stays at Falco's place for the night. He plans to bring her relatives to her in the morning, as they decide it is to dangerous for her to go out in public. After visiting the Senator in his palatial house and verifying Sosia's relationship and her story, and happily getting a contract from the Senator to work for him, Falco leaves the Senator's house intending to return to his small flat and the girl. However, unexpectedly, Falco is suddenly attacked by several large suspicious aediles, young politicians working for praetors who in turn are selected by senators. They want to know where the girl is! What is their involvement and who sent them? Did Decimus Camillus change his mind? No! In the office of the aediles, Sosia's father, Publius Camillus introduces himself. So, much the worse for a beating, Falco and his new companions all return to Falco's flat. Wow, I really liked this! It's very accessible; you can enjoy it even if you don't know a thing about the history of Ancient Rome. The author supplies historical details smoothly without lecturing the reader. The mystery itself wasn't especially gripping, but the story was fast-paced, with truly likeable characters and great dialogue. I started snickering at the dramatis personae and continued to be amused all the way through the book. There are frequent, oddly placed paragraph breaks, which make Wow, I really liked this! It's very accessible; you can enjoy it even if you don't know a thing about the history of Ancient Rome. The author supplies historical details smoothly without lecturing the reader. Enjoyed the reread. I always find new plot points or historical references that I've missed. This time it was Vitellius and mushy peas. Ova knjiga je za mene toalno otkrovenje! Pozajmila sam je od drugarice, u fazonu "Daj nesto da odmorim od fantastike." I nisam se pokajala. Znate one stare, crno-bele filmove o detektivima sa sesiricima i cigarom uvek u kraju usana u ciju kancelariju jednoga dana zaluta prelepa plavusa sa zanimljivim slucajem za istragu. E ova knjia je bas to samo smestena u Stari Rim u vreme Cara Vespazijana. Veliki plus su vrcavi humor i sarkazam glavnog lika. I like the MC in this series. He is like your uncle who lives next door. He is normal, trying to do the best he can....and he can be suckered into things. I liked that I got to see more detail about him. I've read a few of these novels in this series, and they all share some commonalities. The author writes with a contemporary flair.....even though this is Ancient Rome historical fiction. That usually isn't something I like, but she makes it work in her books. I also like the way she constructs I like the MC in this series. He is like your uncle who lives next door. He is normal, trying to do the best he can....and he can be suckered into things. I liked that I got to see more detail about him. Sam Spade? Phillip Marlowe? Mike Hammer? Nope, none other than Marcus Didius Falco the private investigator who is the creation of English author Lindsey Davis. And “The Silver Pigs” is the first of 20 books she has written about the adventures of Falco set in 70 A.D. during the the beginning of the reign of Roman Emperor Vespacian. I always marvel at how well British authors can work with the Roman Empire as a setting, as there are quite a few books and series set in Ancient Rome, as I am also a huge fan of the Medicus series by Ruth Downie – I admit I have not read the works of Steven Saylor from the US but hope to begin shortly. Here Davis has begun a series about the first gumshoe, as Marcus Didius Falco has left the military and has gone into this line of work, as well as working as an informant when the need arises. The plot in this book takes us from Rome to Britain and the Silver mines located there. We have the attempted kidnapping of a 16-year old girl who becomes Falco’s client, along with murder and intrigue at the highest levels of Rome as well as a conspiracy to defraud the Roman government of quite a large amount of silver ingots (thus the title of the book the Silver Pigs as pigs is another word for ingot). It is quite a fun and fascinating book, one that moves along at a very fast pace and provides us with a good plot, a good mystery, a good hero (Falco) and a beguiling heroine. The dialogue is realistic and the history is spot in accurate. If the remaining 19 books are anything like this one, then it will be a wonderful series for one and all to read, especially for those who enjoy history and detective novels. Oh - where do I start? A private eye series set in ancient Rome. This is the first one - I won't add all the books individually, there are (I think) 18 by now, but it's set in Rome in 70AD, the hero is Marcus Didius Falco, a Roman 'informer'.... and his friends, and his over the top family, and his lady, Helena Justina, the senator's daughter, way out of his league but that doesn't stop them, lol, and HER family... They are my favourite ancient Roman couple Evah. There is adventure all over the Oh - where do I start? A private eye series set in ancient Rome. This is the first one - I won't add all the books individually, there are (I think) 18 by now, but it's set in Rome in 70AD, the hero is Marcus Didius Falco, a Roman 'informer'.... and his friends, and his over the top family, and his lady, Helena Justina, the senator's daughter, way out of his league but that doesn't stop them, lol, and HER family... They are my favourite ancient Roman couple Evah. There is adventure all over the Empire, treachery, theft, politics, murder... even children, you name it, you'll find it here. This is the first Davis I read and I loved it. My pal (and fellow author) Fidelis Morgan suggested I give it a try because I couldn't think of a book that wrote about a successful relationship in an interesting way. I have to say that Fidelis was right. Falco and Helene are very solid in their love for one another, but they disagree and argue and do all the usual things couples do without cutting too deep when they disagree. I think that's the key to a relationship (haha, and a sign that it migh This is the first Davis I read and I loved it. My pal (and fellow author) Fidelis Morgan suggested I give it a try because I couldn't think of a book that wrote about a successful relationship in an interesting way. I have to say that Fidelis was right. Falco and Helene are very solid in their love for one another, but they disagree and argue and do all the usual things couples do without cutting too deep when they disagree. I think that's the key to a relationship (haha, and a sign that it might be over)--when you fight, do you go for the jugular or do you hold back because you love that person? Not that I fight a lot. I actually hate fighting. But you know what I mean. Like that scene in the next-to-last (I think) season of the Sopranos when Tony and Carmella are in the pool house and they say the meanest, nastiest things that they can never walk back from... Sara and Jeffrey will never do that. Simplesmente fantástico! Um dos melhores romances históricos que li este ano. Mas ao contrário de Gordiano, Marco Falco é um sedutor e republicano. Os casos que resolve tem como clientes mulheres, que acaba por conquistar, e homens de baixa categoria. No entanto a sua sorte muda, e ele acaba se envolvendo num misterioso c Simplesmente fantástico! Um dos melhores romances históricos que li este ano. Mas ao contrário de Gordiano, Marco Falco é um sedutor e republicano. Os casos que resolve tem como clientes mulheres, que acaba por conquistar, e homens de baixa categoria. No entanto a sua sorte muda, e ele acaba se envolvendo num misterioso crime. Que envolve uma morte de uma jovem e um contrabando de lingotes de prata. Gostei do facto da autor descrever os factos com humor, e não de modo muito sério. Helena foi uma das personagens que mais me encantou. Devido a suas astúcia, a sua independência e determinação. É alguém que não tem medo de arriscar, e tem a coragem suficiente para viver um grande amor. Já para não falar que o envolvimento dela com Falco foi um dos melhores momentos do livro. The series that tarted it all (for me). I always loved ancient Rome (since I first read Asterix), and detective stories. This was the perfect combination. 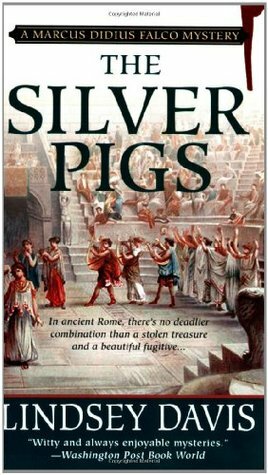 In Silver Pigs, we are introduced to Marcus Didius Falco, a hard-boiled detective set in ancient Rome under Vespasian's rule. Falco is taken on a journey from what starts with an upper-class young lady in trouble with some ruffians, to the highest echelons of society and money counterfeiting. Expect a noir feel to the story, with gruff men and The series that tarted it all (for me). I always loved ancient Rome (since I first read Asterix), and detective stories. This was the perfect combination. Expect a noir feel to the story, with gruff men and damsels in distress. Be aware that this is the first book by Davis, and has some issues (an altogether far too speedy recovery from a broken arm comes to mind). Still, no one can fault Davis for her research and accurate depiction of what life in the stratified Roman society was like at the time. Sugeriram-me que experimentasse a série Marcus Didius Falco, de Lindsey Davis, por ser grande fã da série Roma Sub Rosa, de Steven Saylor. Devo dizer que, com esta comparação, coloquei as expectativas um pouco elevadas, já que adoro as aventuras de Gordiano, e isso fez com que este ‘Porcos de Prata’ me soubesse a pouco. O livro é divertido e lê-se bem, mas a parte do enredo policial deixa muito a desejar e a história em si é um pouco fraca/banal. No início dei por mim a não gostar, sequer, das pe Sugeriram-me que experimentasse a série Marcus Didius Falco, de Lindsey Davis, por ser grande fã da série Roma Sub Rosa, de Steven Saylor. O livro é divertido e lê-se bem, mas a parte do enredo policial deixa muito a desejar e a história em si é um pouco fraca/banal. No início dei por mim a não gostar, sequer, das personagens, opinião que curiosamente se foi modificando ao longo do livro. Também me disseram que o primeiro é o mais fraco da série, pelo que tenciono, ainda assim, dar mais uma oportunidade a Didius Falco no futuro, pode ser que me convença melhor. I first encountered Marcus Didius Falco in a short story in Classical Whodunits, many years ago. At the time I was more interested in the late Roman Republic, so I was more drawn to the Steven Saylor mysteries featuring Gordianus the Finder, contemporary of Cicero and Julius Caesar and the significant events of that era. I later rediscovered Falco through audiobook versions of "A Body in the Bath House" and "The Jupiter Myth," which occur much later in the series. "The Silver Pigs" is the debut I first encountered Marcus Didius Falco in a short story in Classical Whodunits, many years ago. At the time I was more interested in the late Roman Republic, so I was more drawn to the Steven Saylor mysteries featuring Gordianus the Finder, contemporary of Cicero and Julius Caesar and the significant events of that era. I later rediscovered Falco through audiobook versions of "A Body in the Bath House" and "The Jupiter Myth," which occur much later in the series. "The Silver Pigs" is the debut novel introducing Falco and the other characters that dominate the series. Falco's period is also fascinating: after the Year of the Four Emperors, just as Vespasian is beginning his rule. In this inaugural book, Falco - a bawdy, cantankerous "informer" (private investigator) of little means - struggles with a dysfunctional family, a landlord with limited patience for late payments, and not nearly enough work...when a Senator's young niece runs into him (literally) and changes the trajectory of his life. The case, which begins with a maiden with "far too many clothes" fleeing from a band of bully boys, leads Falco through palaces, sewers, and the silver mines of a Britain the former soldier hoped never to see again. Along the way he loves, loses, and loves again (vague enough?) and begins a relationship not just with a Senator's family, but with the new Emperor's as well. The dialog is first person, and reads a bit like Sam Spade in the Subura. You are never left wondering what Falco's opinion is, on any subject or person. As this is the first of many Falco novels, paying attention here is worth it; Davis seems unwilling to let any juicy bits stay on the floor, and applies the Five Second Rule to rescue them for later enjoyment. I can't call Falco lovable, but he's got a gruff charm that - try as he might - he can't hide completely. Along the way, Rome - all of it, not just the polished marble and chalk-white togas, but the stink of the slums, the chaos of the hearth, the perils of travel whether across town or across the continent, the struggle to earn a daily denarius, and the surprisingly but authentically modern-seeming conveniences and complaints of urban life - is itself a vibrant, slightly dangerous but romantic (cough) character. As for Britain: Falco never quite escapes it, and Davis will never be invited to join the Londinium board of tourism. But it too wheezes with what passes for life. First time I've ever bothered to switch edition on a GR book, and that's because reading this book in 260 pages of titchy tiny font really do make a difference. Does slow things down and make it that little bit worse. Still plenty good though. The fun is in the humour because the mystery is sadly a little underdeveloped, but that's okay, because Lindsay Davies as Falco is one of my favourite authorial voices ever; irreverent, sentimental and self-deprecating. When a Philip-Marlowe like character becomes the narrator of events that take place in Ancient Rome, you get Lindsey Davis! The research is excellent, the stories are fascinating, the historical truth is respected and… a sort of hard boiled detective investigates. Probably one of the best historical novels, along with Sharan Newman, on the market. I needed a new series to make me fall in love with a clever detective (informer) all over again, and I really wanted it to be the M Didius Falco series. The long and short of it is that Lindsey Davis failed to make me fall in love. It was more like a mild like. I can't see myself coming back for more of this series. I came looking for a genuine mystery. I was hoping for some Raymond Chandler style Roman detection, or some brooding Henning Mankell style Roman detection, or even some frustrating I I needed a new series to make me fall in love with a clever detective (informer) all over again, and I really wanted it to be the M Didius Falco series. The long and short of it is that Lindsey Davis failed to make me fall in love. It was more like a mild like. I can't see myself coming back for more of this series. I came looking for a genuine mystery. I was hoping for some Raymond Chandler style Roman detection, or some brooding Henning Mankell style Roman detection, or even some frustrating Ian Rankin style Roman detection. What I got was Moonlighting meets Remington Steele meets Hollywood-sword-and-sandal-romantic-mystery-lightness. Ah to be Rome surronded by naked people! Which isn't quite what happens to Marcus Didius Falco; he does seem to get surronded by women an awful lot. This is actually a quite funny, sometimes touching, and very good novel. Falco must solve the mystery of the pigs (which are really silver and not pig shaped at all) while dealing with his mother and various others. Despite the slightly strange first person writing style, I really enjoyed this book. It introduces Marcus Didius Falco, a private informer just about surviving in Rome at the time of the emperor Vespasian. It's fast paced and has all the elements of a novel to keep you entertained, bit of romance, crime, travel... I'll certainly be picking up the next Falco story. I read some series like River Song travels with the Doctor: out of order. I’ve dipped and dallied with various books in the Falco series, but most recently I read Venus in Copper before going back to the source, Falco #1: The Silver Pigs. Here we meet Lindsey Davis’ private eye: Marcus Didius Falco, an informer in the first-century Roman empire. Falco is constantly on the hunt for new clients and new income, lest his greedy landlord send some gladiators around to bust his kneecaps (and other, I read some series like River Song travels with the Doctor: out of order. I’ve dipped and dallied with various books in the Falco series, but most recently I read Venus in Copper before going back to the source, Falco #1: The Silver Pigs. Here we meet Lindsey Davis’ private eye: Marcus Didius Falco, an informer in the first-century Roman empire. Falco is constantly on the hunt for new clients and new income, lest his greedy landlord send some gladiators around to bust his kneecaps (and other, more precious body parts). In this case, Falco gets mixed up in the murder of a senator’s niece and finds himself travelling to Britain, where he meets the same senator’s daughter as he races to uncover a silver theft conspiracy that could topple the emperor. As I pointed out in my review of Venus in Copper, this series has two notable strengths. Firstly, Falco is a great protagonist. Secondly, Davis is great at reifying ancient Rome, describing it in all its glory. She does this in Falco’s voice, making him sound like the native of the city that he is, as he nonchalantly tosses out names and routes from one part of the city to the other. These two strengths more than make up for weaknesses in the plot or mystery, though I think I preferred this mystery over that of Venus’. Falco embodies a lot of the typical private investigator traits, complete with the run-down office/apartment that is somewhat behind on the rent. He gleefully spars verbally with everyone from his mother to potential clients to emperor’s sons, only to become tongue-tied when he meets the one woman he can’t just seduce and then cast away. In this way, Davis also subverts some of the tropes of the private investigator. She establishes Helena Justina as a permanent love interest for Falco. In The Silver Pigs, we get to see their first meeting and the way their relationship begins from mutual animosity towards something approaching amity, and then finally to love. Falco and Helena are a good match for each other: stubborn, clever, and passionate; I wish them well. The other strength of this series lies in Davis’ knowledge of Rome, particularly Roman geography. I don’t spend too much time with the maps at the beginning of historical fiction books. If I need to, I might refer back to them while I read. I like it when I don’t even have to do that. Davis smoothly describes how Falco might be running from one end of Rome to the other, and her easy patter means I don’t have to worry about mapping out the route. Falco should sound like he knows what he’s doing, and Davis makes sure he sounds that way. She creates a consistent voice for him as narrator, expertly balancing between exposition that her modern readers need to know and inferences about would be apparent to someone living in ancient Rome. So many books set in this time period focus on the dynastic struggles. Many take a very wide view of history, with their stories set across decades and dynasties. It is refreshing, then, to have a book like The Silver Pigs. It takes place over the course of about a year, as Falco travels from Rome to Britain and back, with a stint in the lead/silver mines for a few months. In the backdrop of the book, Vespasian is securing his grasp on the throne by celebrating his and his son’s Triumph over Jerusalem. However, this is never more than a side element; the main story is undoubtedly the mystery that Falco decides he must solve. I admit that Davis’ penchant for describing the political ramifications of her villains’ machinations is not at the same level as her geography. She does her best to explain how bribing the Praetorian Guard could lead to Vespasian’s downfall; however, this never demonstrates much suspense. The most realistic and compelling part of the mystery is Falco’s drive to avenge the death of Sofia. It’s easy to believe in that, regardless of the time period one might be from. So, while this isn’t one of the book’s strengths, there are plenty of books about ancient Rome that do have cutting political philosophy. The mystery itself burgeons with suspects and villains, though we don’t actually meet many of them, and some of the ones we do meet turn up dead or missing. What drives Falco is the constant sense of danger as the ground shifts beneath his feet. I don’t have a lot of experience with pulp detective fiction, but I’m given to understand that often the protagonist can’t even trust the people he works for—they can have shady agendas as well. This is certainly the case here, where Falco manages to pick up not one but three employers: Helena Justina’s father, Helena herself, and the Emperor (in the form of his son, Titus). Watching Falco deal with the people who are supposed to be helping him is probably as much, if not more, fun as watching him deal with the people who want to hurt him. The Silver Pigs is a promising start to the Falco series. I think it would probably give a first-time reader a good indication of whether they can expect to like the rest of the books. I certainly intend to continue dipping into this series at a leisurely pace. These books are excellent works of historical fiction when it comes to setting and character. Davis set out to write mystery in ancient Rome … and she has certainly succeeded. Rome, AD 70: Roman sleuth Marcus Didius Falco chances upon an illegal trade in precious metal (the silver pigs) after mounting a rescue from a kidnap gang. Anton Lesser brings the popular detective to life in Lindsey Davis's witty and enthralling adventures set in the days of the Roman Empire. Dramatised by Mary Cutler. With Felicity Jones as Sosia, Ben Crowe as Petronius, Robert Lister as Decimus, Richard Derrington as Publius and Frances Jeater as Falco's Mother. Directed in Birmingham by Peter Leslie Wild. Algo lioso e introductorio, pero ha estado bien, un libro ligero con mucha historia, cosa que me viene genial para lo que estudio. A ver si los siguientes son mejores, pero el segundo lo leeré después de exámenes, quería terminar este antes de que empezasen. It seems like a promising premise: take the noir stock character of the down-and-out gumshoe, gruff on the outside but with a soft center, and move it to Imperial Rome. Throw in some local color, a know-it-all mother, a couple of dames, some nasty bad guys, and an engaging interlude in the uncivilized wilds of Britain, seen through the eyes of the urbane Roman private eye Marcus Didius Falco. Unfortunately, The Silver Pigs didn't quite work for me. For one thing, despite the author's detailed des It seems like a promising premise: take the noir stock character of the down-and-out gumshoe, gruff on the outside but with a soft center, and move it to Imperial Rome. Throw in some local color, a know-it-all mother, a couple of dames, some nasty bad guys, and an engaging interlude in the uncivilized wilds of Britain, seen through the eyes of the urbane Roman private eye Marcus Didius Falco. Unfortunately, The Silver Pigs didn't quite work for me. For one thing, despite the author's detailed descriptions of the geography and the society in Rome, it never felt vivid or real to me. I had no concrete sense of the city or its inhabitants. Also, I couldn't really bring myself to care about the mystery, even though it begins with the murder of a lovely, innocent girl. I did enjoy the character of Helena Justina, divorced socialite, cousin of the murdered girl, a no-nonsense young woman of exceptional intelligence who is not in the least shy about going after what she wants--which happens to be the hero. She almost salvaged the book for me--almost but not quite. 3.5 stars - I enjoyed Helena, Falco, his mother and Publius and several other characters in this Ancient Roman mystery, but I've never been much into the period and had a hard time getting into it - but I'd been hearing about the series for so long I wanted to give it a try. The characters were definitely a strong point and I plan to look for the next book in this long and popular series; while there was plenty of dry humor and excellent research into the period, the mystery itself was very compl 3.5 stars - I enjoyed Helena, Falco, his mother and Publius and several other characters in this Ancient Roman mystery, but I've never been much into the period and had a hard time getting into it - but I'd been hearing about the series for so long I wanted to give it a try. The characters were definitely a strong point and I plan to look for the next book in this long and popular series; while there was plenty of dry humor and excellent research into the period, the mystery itself was very complex and had a lot of parts and potential bad guys - I had a hard time telling them apart (I think it's the Roman names!). Not bad, but it has some flaws. The book has a good pace and several charismatic characters. Plus the emperor and caesars have an original (but don't know if realistic) psychological portrait. The bad part, for me, has to do with the writing. I cannot say that Davis can't write, but she has problems with the order of exposition (she puts the horse before the cart, making you think you've lost something you can't find running through previous pages, just to let you discover that it's the conclusi Not bad, but it has some flaws. The book has a good pace and several charismatic characters. Plus the emperor and caesars have an original (but don't know if realistic) psychological portrait. Listened to the audiobook narrated by Christian Rodska - superb narration, really flavorful British accents throughout and brought all the characters to life. The story is fast paced and involves a detailed plot of embezzlement, murder, and class politics. Out hero, Falco, appears quite rough around the edges and of low character when we first meet him, but don't be put off-this is as much a story about the internal life and evolution of Falco as it is about government intrigue. Run don't walk to your local bookseller and start this fantastic series of first century Rome detective Marcus Falco. He will win your heart and his nutty family and associats will continue to delight through many adventures. Lindsey Davis, historical novelist, was born in Birmingham, England in 1949. Having taken a degree in English literature at Oxford University (Lady Margaret Hall), she became a civil servant. She left the civil service after 13 years, and when a romantic novel she had written was runner up for the 1985 Georgette Heyer Historical Novel Prize, she decided to become a writer, writing at first romanti Lindsey Davis, historical novelist, was born in Birmingham, England in 1949. Having taken a degree in English literature at Oxford University (Lady Margaret Hall), she became a civil servant. She left the civil service after 13 years, and when a romantic novel she had written was runner up for the 1985 Georgette Heyer Historical Novel Prize, she decided to become a writer, writing at first romantic serials for the UK women's magazine Woman's Realm. Her interest in history and archaeology led to her writing a historical novel about Vespasian and his lover Antonia Caenis (The Course of Honour), for which she couldn't find a publisher. She tried again, and her first novel featuring the Roman "detective", Marcus Didius Falco, The Silver Pigs, set in the same time period and published in 1989, was the start of her runaway success as a writer of historical whodunnits. A further nineteen Falco novels and Falco: The Official Companion have followed, as well as The Course of Honour, which was finally published in 1998. Rebels and Traitors, set in the period of the English Civil War, was published in September 2009. Davis has won many literary awards, and was honorary president of the Classical Association from 1997 to 1998.